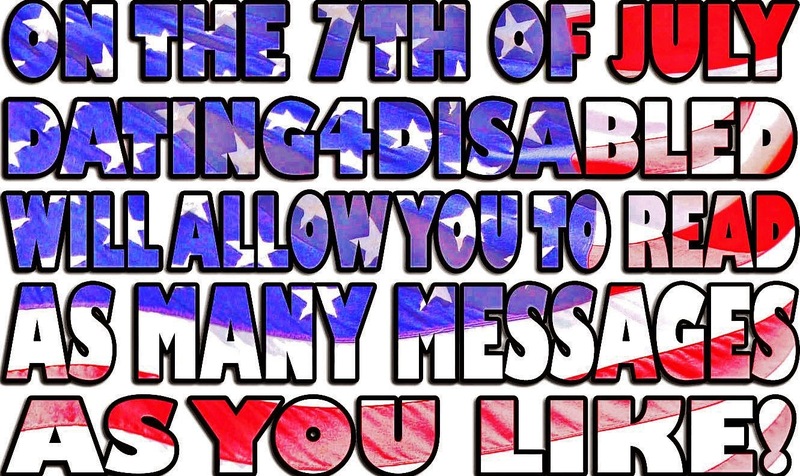 Admin D4D: On the 4th of July Dating4Disabled Will Be Opening Its Doors! On the 4th of July Dating4Disabled Will Be Opening Its Doors! Hey dating4disabled members! In honor of the 4th of July all Dating for disabled members will be able to send and receive as many messages as they like. From MONDAY THE 7TH of JULY, 8am (east coast time), until Tuesday the 8th-8am (east coast time), you can log-onto dating4disabled and read your messages with no limitations. Even if you live in another country this is open to you (just make sure to check the time difference so you don't get the window wrong). You don't need to sign up for this anywhere or win anything- this is open to everyone so long as you have and active disabled dating profile. If you don't, now would be a great opportunity to register for the site (juts click here to do that). Don't miss out on this one off amazing opportunity, and make sure you are around on the 7th!